From over the years and years of feltmaking, I have an abundance (I mean shoe boxes full) of felted wool balls in all colors, shapes and sizes. Now what to do with them? 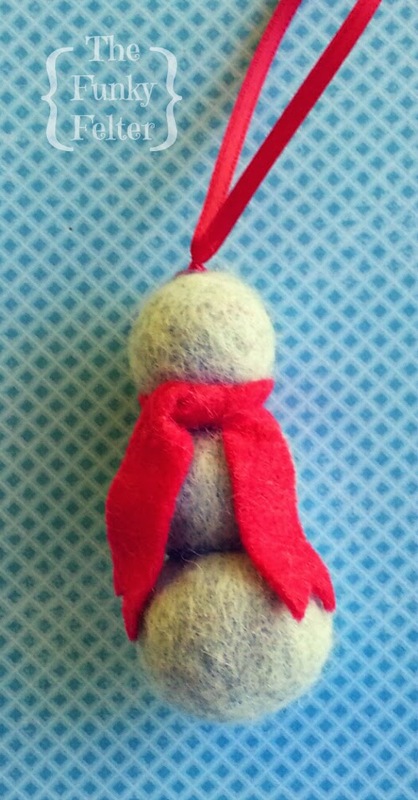 The crafting possibilities are endless from jewelry to clothing embellishments to something like this cute snowman ornament. The craft tutorial below assumes that you have your own small (or big!) stash of felted wool balls on hand. If you don't, you can buy them online on sites like Etsy, at large chain craft stores in small quantities or you can make your own batch. As with every craft, there are numerous ways to make them. It is worth a little of your time to read my post "9 helpful tips for making wool beads" - there's tutorial links and recommendations there too! Also check out my "Wool balls, beads and the like"Pinterest board. There's a lot of inspiration as well as links to some good tutorials on how to make wool beads. Red felt craft sheet or felted sweater material, etc. Not loving the hot glue for your craft projects? That's okay. You can easily use embroidery floss and a tapestry needle to stitch these together instead. It will look much the same, just take a little longer to make. If you are making these with kids, be sure to supervise the hot glue gun well or use an alternative quick-drying wet glue. Gather your materials for one or several of these cute snowmen. Either hot glue or stitch three felted wool balls together - stacked on top of each other. Cut about a 1/2 inch wide 8 to 10 inch long strip of felt or other non-raveling material. Dove tail the ends or cut at an angle. Then tie around your snowman's neck in a knot. Use a little hot glue or stitch the scarf in place. Cut about an 8 inch length of the ribbon. Tie ends in a knot and hot glue or sew on top your snowman's head. That's it! You're all done! Now repeat for a cute collection of handmade Christmas ornaments - great for gifts or to decorate your own tree.